Shut down fast. Send a SIGTERM signal, but wait only one second before rebooting. Shut down the specified node (default is current node). system — shut down the system. reboot — reboot the system. If no -S option is specified, the shutdown type is read from $HOME/.ph/phshutdown.cfg, if it exists. This file contains the shutdown type selected the last time phshutdown was used. If this file doesn't exist, phshutdown uses the default type of reboot. Shut down without displaying the shutdown options dialog. This option may be useful for using phshutdown in a script. The presence of this file allows any user to end a Photon session, but prevents users who do not have the root password from shutting down or rebooting the machine. If you are root, this restriction does not apply unless you pass the -i option with phshutdown. In this case, you are treated as a non-root user and will be asked for the root password before being allowed to shut the system down. 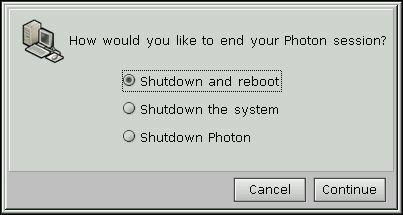 Using this option always provides a secure shutdown dialog, even from phlogin, where it's always root that launches phshutdown. The ten-second interval allows processes that have elected to catch the SIGTERM signal to perform any cleanup they need to do before the system is rebooted. The presence of this file prevents non-root users from shutting down or rebooting the machine. This file holds the type of shut down selected the last time phshutdown was used.